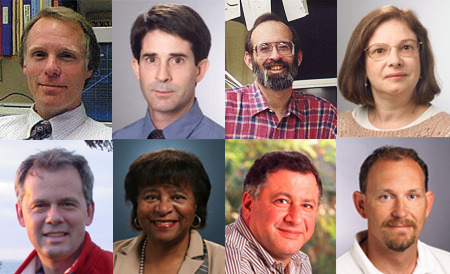 Top row, left to right: Eric L. Chronister, Timothy Close, Richard J. Debus, and Darleen A. DeMason; bottom row, left to right: Timothy W. Lyons, Yolanda Moses, Walid A. Najjar, and Daniel Schlenk. RIVERSIDE, Calif. – Eight researchers at the University of California, Riverside have been named fellows of the American Association for the Advancement of Science (AAAS). Including this year’s fellows, the total number of UCR faculty members who have been recognized with AAAS Fellow distinction is 180. New fellows will be presented with an official certificate and a gold and blue (representing science and engineering, respectively) rosette pin on Feb. 20 during the annual meeting of the AAAS next year in San Diego. All the 2009 AAAS Fellows will be announced in the Dec. 18 issue of Science, a weekly magazine published by the AAAS. The tradition of AAAS Fellows began in 1874. Currently, members can be considered for the rank of fellow if nominated by the steering groups of the AAAS’s sections; by three fellows; or by the association’s chief executive officer. The AAAS is the world’s largest general scientific society. Founded in 1848, the association includes some 262 affiliated societies and academies of science, serving 10 million individuals.